After running with my first ever build for about 6 years, I had been playing with the idea of starting over and building a gaming computer right. I'm not in college anymore, I have a real job, I can afford to not cut corners. My MSI GTX 970 was the newest part in my old computer, and it could still handle most games pretty well, so I decided to wait out the crypto craze before putting together a new build. When I learned the new GTX 12 series was coming out soon, I started to get excited. As you might be able to tell from the last sentence, I couldn't contain myself when I found out the new series wasn't going to be GTX at all, but RTX. I had started my build on PCPartpicker with a 1080ti as a placeholder for the new series... but when I learned the RTX 2080ti was going to come out at the same time as the RTX2080 I had to get it. I was unable to secure one of the first cards produced, but it turns out that was probably a good thing seeing as some of the 1st release 2080ti cards had issues. I still went ahead and bought the rest of the pieces on or around Amazon Prime day, some of the sales were just too good to pass up, and I managed to convince the wife to let me buy the rest off of NewEgg when they released competing sales the next day. I ran with the GTX 970 in the new build until Black Friday, when I finally pulled the trigger on the MSI RTX 2080ti. I couldn't be happier with the result. I feel as though I definitely started falling into rabbit holes during the virtual build, and more often than not I upgraded things that, to be perfectly honest, I probably didn't need to upgrade. However I am super pleased with the end result, and as a hidden bonus I feel that breaking up the GPU and the rest of the parts purchases managed to keep my wife aggro low since I still don't think she's seen the final sticker price... I'll give a quick rundown, part by part. CPU: Intel Core i7-8700k - self explanatory. My previous build had an i7 3820 (to give an idea of how old that was) and I found it more than adequate for gaming and video editing. I went with the top of the line i7 8th generation model because in this one case I don't understand why people would need an i9 aside from bragging rights. Consider this the one time during this build I was able to reign in my impulses... Another reason for choosing the i7 over the i9 (or any X series) is an integrated GPU. I wouldn't recommend it, but I did toy with the idea of not installing any GPU until I had the new one... but I rightly decided that would be pointless and temporarily installed the old GPU. Edit: Swapped out for an i7-9700k as I shift around where CPUs go. It makes more sense to have more cores on the gaming computer and more threads on the editing computer. 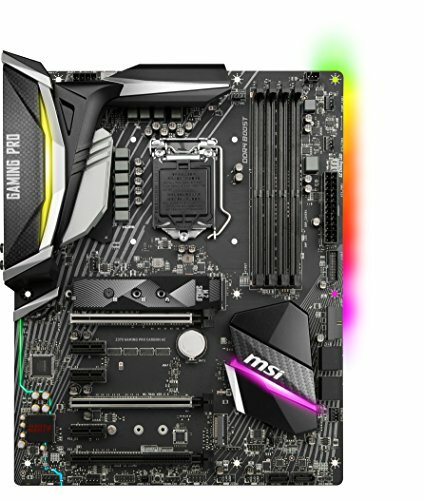 Motherboard: MSI Z370 - my previous CPU came all the way back when LGA 2011 was the only socket available for an i7. I was weirdly excited to build in the more common LGA 1151... I mean a motherboard is a pretty standard thing, but I really like the appearance of the board, the RGBs are pretty, and Z370 is the best chipset for my purposes. I'm also a huge MSI fanboy ever since buying one of their gaming laptops a few years back. Picking this motherboard was an obvious choice once those factors were combined. Bonus: I had just been debating the merits of M.2 NVMe vs traditional SSDs with a friend at work, and I loved the fact that this board has space for two. Works with 9th gen 9700k with a simple BIOS flash - DO NOT FORGET TO DO THIS BEFORE INSTALLING A 9TH GEN CPU!! Hard Drive: WD Black NVMe 1TB - Initially, I made it to my cart with a traditional SSD on the day of purchase. Then I noticed the Amazon Prime Day deal for the NVMe. At almost half off the original price, I couldn't control myself. I love it. It's so fast, and it made cable management simple since it literally lives on the motherboard. I continually marvel at the technological wonder that is a 7x speed SSD that's wafer thin and difficult to find if you don't know exactly where to look on the motherboard. As for storage, 1TB is more than enough to hold all of my games since I'm a compulsive hard drive cleaner, and I use an 8TB external drive to hold all of my movies... for now. (Look out for an insanely impractical HTPC build from me in the future... Compy 1.0 is gonna become a Frankenstram media box very soon). Boot time with the NVMe is insane. I'm talking 4 seconds power-to-gaming fast. One time playing WoW with friends, my cat stepped on the power button in the middle of a mythic dungeon I was tanking, and I just turned it back on and logged in again. It was so fast I didn't even die. Edit: 4 second boot time may be from MSI Fast Boot setting being enabled. It's incredible but disables USB until booted, so make sure to enable "hold power 4 seconds to skip to BIOS" beforehand to ensure you can get back into BIOS later. CPU Cooler: TT Floe Riing 240 - If I'm being honest, the CPU cooler is where I kinda lost the plot on this build. Compy 1.0 had your standard, predictable Cooler Master 212 on it and I never had an issue. My friends and I had talked about liquid cooling and how it was definitely the way to go, but we privately acknowledged that it wasn't critical to the builds / loads we were dealing with. 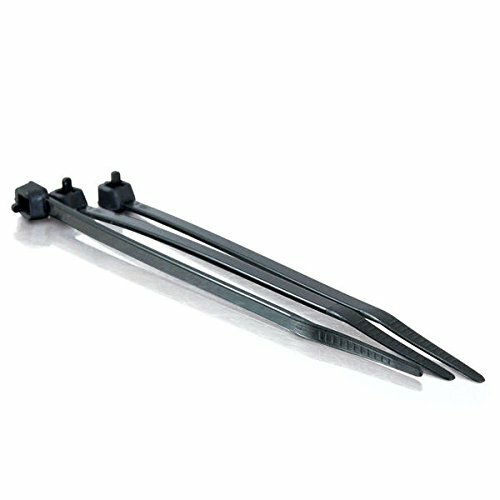 Thermaltake's Floe Riings dazzled me and forced me to change my mind, however. The RGB light party was too much cool for me to ignore, and it is practical... so I went with it. Installation was easy, customization was a breeze with the TT RGB Plus tool, and now my old CPU looks downright boring with it's dinky two red LEDs. I have millions of colors available now! I can customize my build to a different color scheme on a daily basis! What did I do with this freedom? Well... I'll let you know if I ever do anything with it... turns out the standard rainbow effect is really dazzling and hard to go away from. Case: Corsair Crystal 460X - If there's one complaint I have with this build, it's that the case is just too small to fit a liquid AIO in the top, which was my original plan. However, mounting on the front was a cinch, didn't compromise any rainbow prettiness, and technically has better thermal performance than a top mounted AIO (While on top the air is exhausted through the radiator - meaning slightly warm case air is being pushed out of the case - on the front the air passing over the radiator is fresh, cool air. The downside is the case air is likely slightly warmer, but the CPU is cooler, and as long as the GPU isn't a blower style the case air would likely rise to a similar temperature anyways). 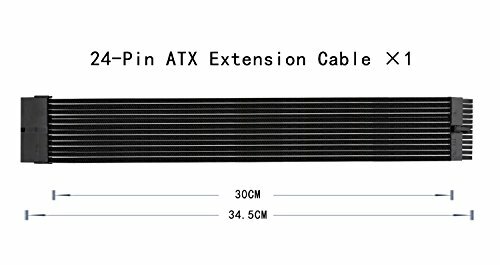 Cable management is also a bit rough in this case, as it's just small for an ATX case. That said, I think in the end I did a pretty decent job of cramming it all in - thanks in large part to a generous heaping of zip-ties. The back cover is pretty difficult to finagle back on once removed, but I also just happen to have an overabundance of cables living in the case, with sleeved PSU extensions and the ridiculously long cables included with the Thermaltake fans. Speaking of fans, there are two models of the 460X available for sale, one with 3 RGB fans pre-installed and one with just one. Since I knew I was going overboard with Thermaltake Floe Riing fans I opted to get the cheaper case and swap the fan. RAM: Corsair Vengeance DDR4-3600 - well, when you make it to RAM in a build you face a dilemma... RAM can be expensive these days... and by now you likely have some other components picked out and... well it would be an absolute shame if your RAM didn't also have pretty LEDs on it... Fortunately Amazon Prime Day came through for me and I was able to upgrade from 3000MHz to 3600MHz clockspeed RAM for $20. Unnecessary? Yes. Good deal? Also yes. Any questions? Let's move on. Edit: Added a second 16GB kit on sale. PSU: TT RGB Plus 750W Gold - The fact that this PSU is RGB is completely unnecessary. I can't even see it in my build. If you could see it I imagine it's a nice touch though. The real reason I bought this PSU in particular was serendipity. It just so happened that a Thermaltake RGB PSU was the cheapest option when I filtered for 80+ Gold efficiency and fully modular >600W PSUs. I wasn't gonna say no to more RGB either. Misc: Rounding out the build we have a copy of Win10, 3 extra Floe Riing plus 120mm fans to fill out the case (3x front including the 2 on the AIO radiator and 2x top exhaust), sleeved cable extensions and combs for beautification, and lastly zip ties. Edit: Added one final 120mm Floe Riing plus 120mm fan to replace the exhaust fan... can't believe I forgot that in the initial build. Much improved. Final Thoughts: This build was a blast to put together, and although it's a tight squeeze inside the case, the finished product looks nice and isn't massive. I should have plenty of power for gaming for a few good years, and it feels nice to have a complete build without any corners cut for anything. 12/20 Edit: Added an extra TT Riing Plus 12 Fan to replace the standard Corsair exhaust fan in the rear. Works great! Synced to the top 2 exhaust fans and AIO cooler block on fan controller 2. Also, thanks to someone pointing out here on PC Partpicker that Win10 Home now supports 128GB RAM, I lovingly shoved in 2 extra 8GB sticks I had, bringing the total to 32GB. Updated pictures will follow sometime later. 1/12 Edit: Flashed BIOS and installed i7-9700k. Updated parts list and descriptions. Amazing performance. 8 cores and 8 threads make it best suited to pure gaming. Mesmerizing light display, easy to use TT RGB Plus software, and oh yeah, it's a whisper quiet AIO liquid CPU cooler. I installed mine as an intake in the front of my case to cool my i7-8600k. I was unable to fit it above the motherboard as an exhaust due to having a smaller case (Corsair 460X), but in practice I think I like it better mounted as intake. Cool, fresh air over radiator means better CPU temperatures, which means slower fan speed, which means this thing is silent. Super easy to install as well. Note that mounting it as an intake will mean that warmed air is pushed into the case, but the two pieces of gear that is going to impact most are the CPU (which is cooled by this cooler) and the GPU. If the GPU is an open model it will have a negligible increase in temperature in this configuration, however temps could rise slightly more if using a blower-model GPU, as the air being blown is "pre-warmed". If I could nitpick to find a complaint, I'd say that having the 12 addressable LEDs on the fans while there are 6 on the actual block uhh... is less than 12? In standard spinning rainbow pattern, you can notice the lack of all 12 colors if you're really looking for it... Don't get too in the weeds, it's a fantastic AIO cooler and very pretty to boot! As an MSI fanboy, I'm over the moon with this motherboard. I love the M.2 shield and the reinforced metal PCIe slots for GPUs. I'm also relieved to see a neutral black color scheme, which is shockingly hard to find in today's RGB dominated world. The LEDs are full RGB, though it took some time to configure MSIs Mystic App to recognize the board and allow me to set it from default red to cycling rainbow colors. The included heat shield is also deceptively big. I have large fingers and found it hard to deal with the top left corner of the board, but it was still manageable. An AC wifi card was included, which is a nice bonus... I mean I have it set up as ethernet hard-wired like I assume anyone wanting to game would, but that doesn't mean I didn't also pop in the card to the lowermost PCIe slot. Fantastic board, all in all. Oh my... do you want to talk about something that's amazing? I thought it was incredible when I saw how fast an SSD boots up. I had heard that NVMe was supposedly 7x as fast as traditional SATA SSDs. I was still wholly unprepared for just how awesome this thing is in practice. And it's tiny!! The whole thing rests on the motherboard and if you don't know where to look I swear you'd miss it. The fact that this tiny wafer of silicone is 1TB of storage is still blowing my mind. And the speed... my boot time is 4 seconds from pressing the power button to having a blank desktop. It's incredible. The one "complaint" I might have is that the installation made me sweat... you're handling a ridiculously small, even more ridiculously thin hard drive, and the way to install it is to plug it in at a 30 degree angle and then bend it down to screw it in to the motherboard... It feels very secure and I'm beyond happy now that it's in, but I'd be lying if I told you I didn't worry I might accidentally snap it during installation. This case is a beautifully designed mid tower. It's slightly small, but that works in its favor as it better showcases your beautiful build and all of its RGB goodness with an abundance of tempered glass. There are only two downsides I can think of: 1 the motherboard gets mounted too close to the top of the case to allow for installation of a top mounted AIO radiator. There's enough space at the front of the case to allow for both a front mounted AIO radiator and a full size graphics card (although it is slightly tight) so that's not really the worst complaint. 2 cable management is TIGHT on the back. Part of this is my own fault for using braided cable extensions and replacing all the fans with Thermaltake Floe Riing fans (which have insanely long cables), but even with careful management and tons of zipties, it takes a bit of effort to squeeze the back cover on. These complaints are totally negated once the build is complete. I'm very happy. 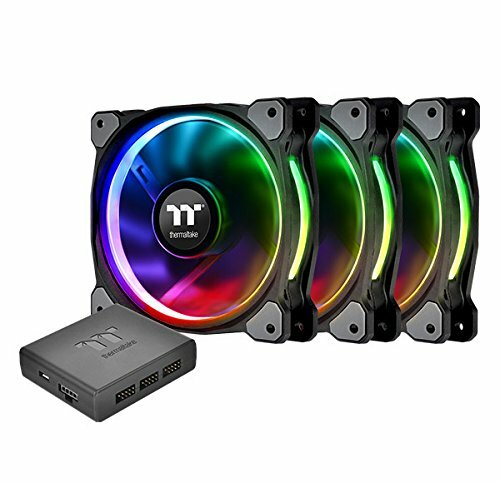 Note that the 460X comes either with 1x120mm solid color RGB front fan preinstalled or 3x120mm RGB fans - as I planned on using all Thermaltake Floe Riing fans I opted for the cheaper 1x120mm option and just replaced it. More RGB is always more better, right? I can't even see the RGB fan due to my case's shroud, but to be honest I really only chose this particular PSU because it fit the criteria of 80+gold, 600W+, and fully modular. The fact that it's Thermaltake and RGB were just bonuses. It was really a no-brainer since the price was the same as the other options. Nice Looking Build! I think the Black cable extensions work really well with the rest of the build. Keeps it looking pretty clean! lmao on a scale of 1-10... how overkill is the 2080 ti? Yeah I'm loving my new PC and I bet you love yours as well. Thank you for the reply! Is the msi duke 2080 ti better than the msi x tiro 2080 ti with benchmarks?